More than dental care. People care. Give us a call. We'd be happy to talk with you about our services. Parking Information: The building provides paid parking (we're sorry but parking validations are not provided by the clinic). There is also plenty of metered parking around the building perimeter (Colby St, Butler St, and Olympic Blvd), as well as free street parking on Colby St. across the street from the clinic. "A trip to the dentist isn't supposed to be relaxing and enjoyable. But, that is exactly what I experienced with Dr. Kederian. Her attention to my comfort level, not to mention the high quality of her work, make her the best all around dentist I have ever visited." 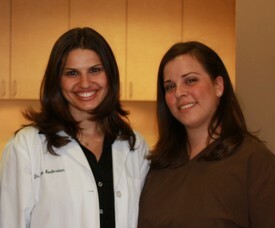 "Dr. Kederian is a very professional and personable. She is thorough, considerate, cost conscious and has always accomodated me during my dental emergencies. I feel very fortunate to have a dentist who treats me with respect and shows genuine interest in my oral heath care."